UK energy policy has become rather entangled in the dramatic reorganization of government that has taken place since the nation opted out of the European Union. It’s barely a week since Theresa May became the new leader of the Conservative party, and by extension the new Prime Minister. By all accounts, she’s settled in quickly: a major cabinet reshuffle involving major (and controversial) new roles for Brexit campaigners, early talks with Scotland’s first minister in view of Scotland’s significant pro-EU support, and preparations for meetings with German and French leaders this week. She’s also found time to replace the Department of Energy and Climate Change (DECC) with a larger, more extensive and over-arching Department for Business, Energy and Industrial Strategy (BEIS). There are two broad schools of thought about whether the switch is a good thing. One is that it is sensible to tie the energy needs of the country ever more tightly with business and industrial development. The flip side is concern that climate change – as an agenda issue – will slide down the priority list, subsumed by pressing business and industrial growth demands. The creation of the new BEIS department has divided opinion between political groups and environmentalists. Greg Clark will lead the new department. Under the reshuffle, government energy lead (and recent contender for Prime Minister) Andrea Leadsom becomes environment secretary. 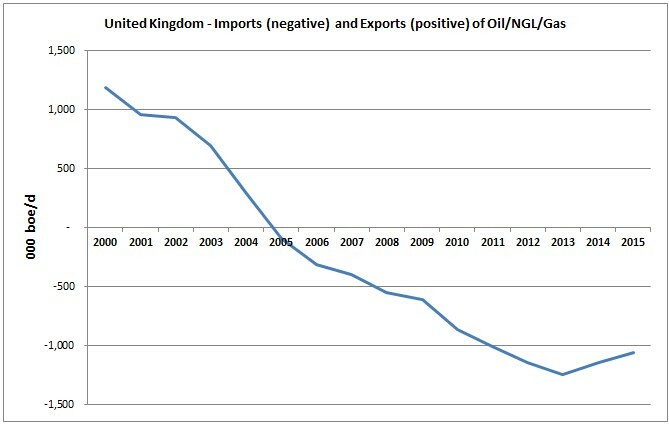 The UK, with its history of offshore production, was a net exporter of oil, natural gas liquids and gas until 2005. Since that time, however, the UK has been reliant on overseas imports to meet energy needs. Data from our Evaluate Energy team confirms that in the past decade that disparity has been greatest in 2013, when the UK imported 1.2 million boe/d more than it exported. In 2015, that figure was down slightly, at 1.05 million boe/d. 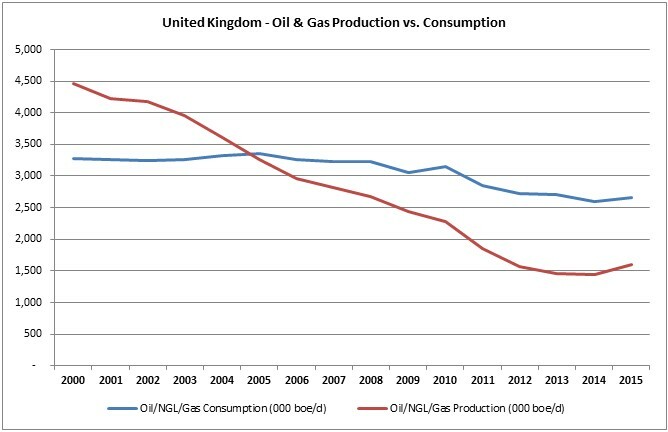 Overall UK consumption of oil/NGL/gas peaked in 2005, at 3.5 million boe/d. It has declined virtually every year since, and stood at 2.6 million boe/d in 2015. Meanwhile, our data confirms that UK oil/NGL/gas production has declined every year since 2000, when it stood at 4.45 million boe/d, to 1.44 million boe/d in 2014. It increased slightly in 2015, to 1.6 million boe/d. Prime Minister May’s tone feels very much in tune with the former DECC list of energy priorities, where security of domestic energy supply ranked very high indeed. Earlier this year, as energy minister, Leadsom reinforced the need for UK energy security. She was addressing the Shale World UK conference, which focused upon the potential for on-shore UK shale gas. Leadsom positioned shale gas as an “effective low-carbon bridge” amid broader goals to reduce the nation’s reliance upon coal and secure alternative future power supplies. She viewed shale as a homegrown solution that would in turn create many thousands of jobs during development and ongoing production phases.